The start of the last 100 kms. Our favorite time on the Camino is the morning. We are not particularly early risers, but most mornings we are walking by 8:00 a.m. We walk in silence. We watch and we listen. The harmony of Mother Nature’s symphony orchestra of coo-coo birds and hoot owls and bullfrogs and crickets and the sweet chirp of a multitude of birds fills our ears. We hear cows moo – do you know why cows moo? I googled it. You should too. We hear sheep bleat, dogs bark, cats meow, chickens cluck and roosters crow. By the way, I am completely convinced roosters have no idea what time it is. 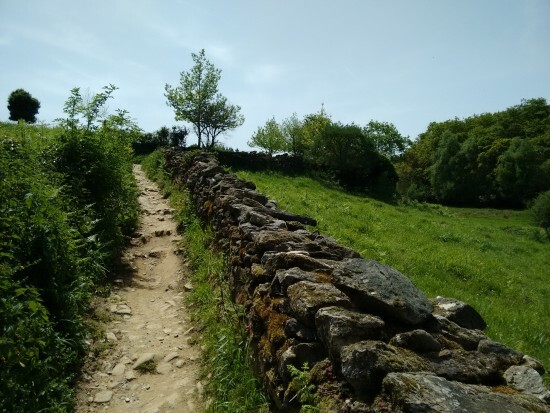 It’s our time on the Camino to just walk and lose ourselves in our thoughts. And listen. When we started this journey – one month ago today – we would walk for hours and not see another person. We’d stop at a cafe and maybe 3 or 4 other pilgrims would be there. Each historic village we would walk through, the locals would put out the welcome mat for us. Maybe, on any given day, we’d see a total of 50 pilgrims. I’m sure there were more out there, we just didn’t cross paths. We didn’t know how fortunate we were to be given that time, 3 1/2 weeks, of peace on the Camino. Turns out it was quite the gift. For the past few days there has been a change in the air. Each morning we feel it growing; more and more pilgrims on the Camino. Two days ago 50 high school students started walking and we were caught in the mass throughout the day. It’s as if everyone popped out of nowhere and started walking. We’d heard stories from experienced pilgrims and we’d read about walking the Camino de Santiago beyond Sarria. Just west of Sarria is the 100 km point. 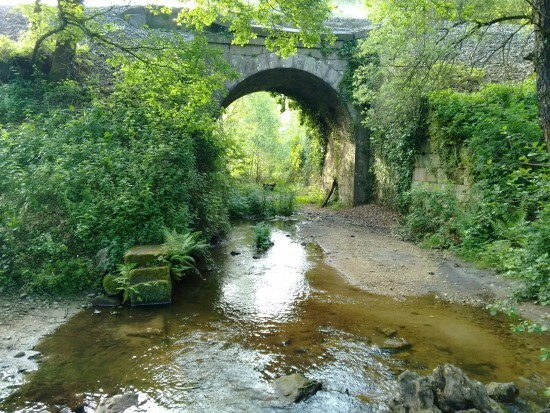 Anyone who walks at least 100 km receives a compostela upon reaching Santiago, so Sarria is where everyone laces up and hits the trail. 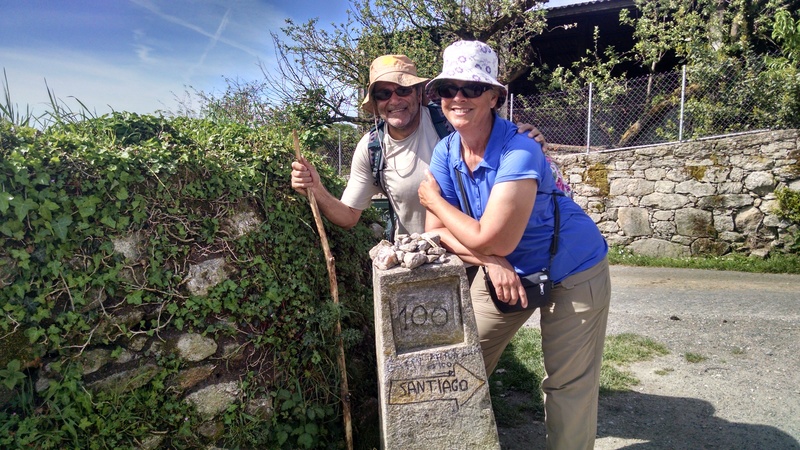 Moms, Dads, grandparents, kids, couples, soloists, even babies are walking the Camino. Instead of 3 or 4 pilgrims at a cafe, there are 30 – 40. There are lines for the WC and yesterday, as I walked into a cafe to use the WC – something I’ve done since day 1 – the proprietor put his hands up and told me to slow down! Let’s just say he didn’t have the Camino spirit and we’ll leave it at that. There is a very different vibe in the air. Pink sneakers with matching ball caps and pony tails and skin tight black spandex leggings have become the norm. No disrespect to pink sneakers, I’m just setting the scene a bit. Groups of friends are now on the Camino, large groups, loud groups, groups that talk incessantly and plow by you at a marathon pace. What’s the hurry?! 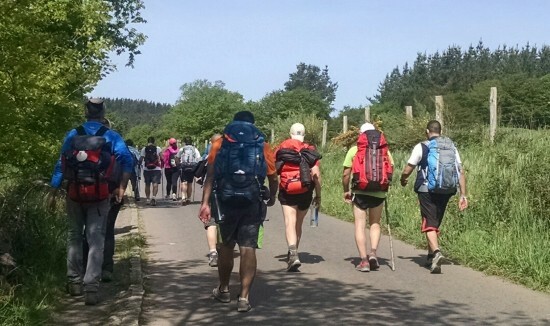 There is an unspoken philosophy on the Camino, do not judge anyone’s Camino. I get it. I respect it. It’s hard not to judge, however, when a man walks up behind me puffing a nasty cigar, or I can’t help but overhear a conversation behind me about how her sister used to post photos of her cleavage on her FB page, or a group of bicyclists roll right up behind me. 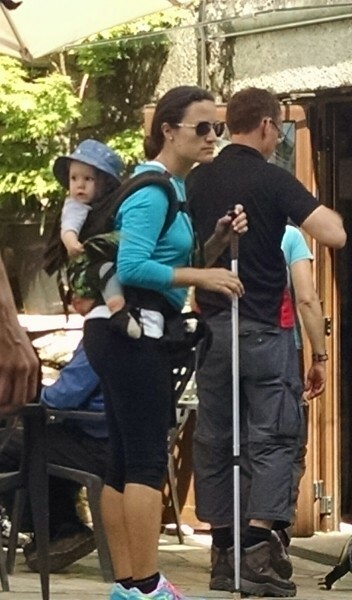 Add in the clickity clack of walking sticks and cell phones ringing… I can’t escape it. Their journey is impacting my journey. There is too much noise. But still we walk. It’s a different journey now, but still we walk and isn’t that what life is all about? When 1 way gets too noisy, we find another way. So true! It is everyone’s own Camino, but the loud talk and crowds really took some adjusting to for me also. I’d just stop to adjust my shoelaces or to take a drink or a picture to let them pass. So many lessons to learn, right?! 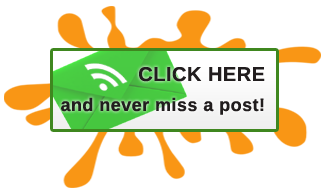 Buen Camino – you’re so close! I feel like you – I don’t like noise (or crowds) so I think you’re now swaying me to believe this walk would not be for me! Linda, we’re actually way past the 1/2 way point, we’re only 3 nights out of Santiago! 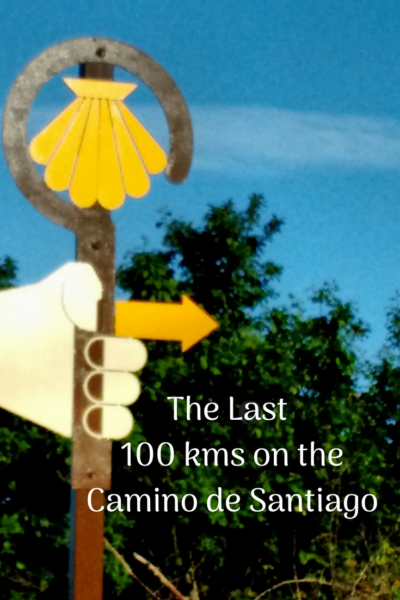 It’s only the last 100 kms – or about 5 – 7 days when the Camino becomes so busy. Or, anytime during the summer months, I would never walk in June, July or August because of the number of people on the trail and because of the heat. We started on April 12 and the timing was great, the other shoulder season is September into October. Well the scenery is still gorgeous even if the Camino is getting crowded. But that’s really sad that the peace and quiet is interrupted. 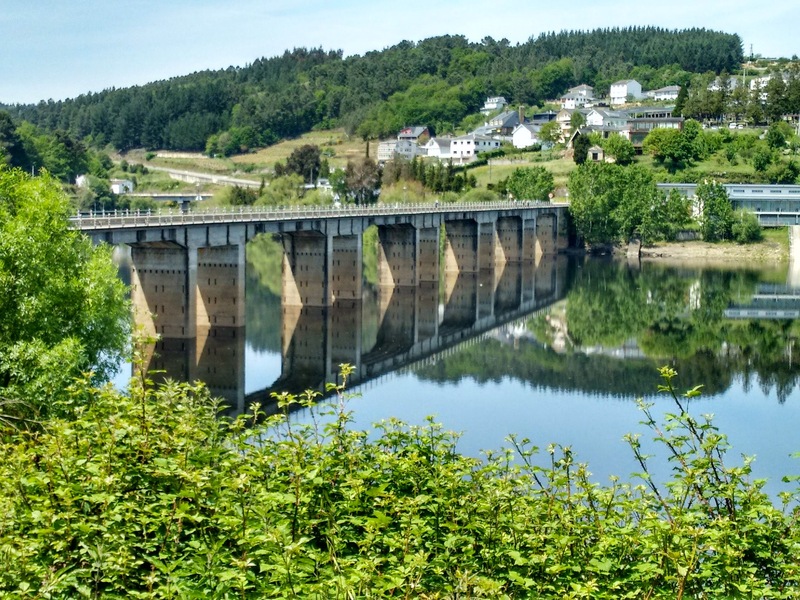 The scenery along the Camino has just been so amazing, we’ve loved it and we have many great memories of the highlights. I am still endlessly impressed you are still walking after the photo you posted of your feet a while back. At least everyone is walking in the same direction. I’ll be following along. Buena suerte. Occasionally, we’ll come across a pilgrim who is walking the reverse trail. I think it’s a bit of a rebel and my hat is off to them! Only half way?? I didn’t realize it was so long. How are your feet? Nope, we’re just about done and we’ll walk in to Santiago on Saturday, can you believe it?! Yay! Pati, I can’t believe that you are nearly there. It has been quite a challenge, but you and Abi have not given up, well done you. I would be interested to know what are the physical changes? Apart from very sore feet, do you feel a lot fitter now? A 30 minutes walk in the local park will not be enough any longer? Would you do something like this again in the future? Enjoy your last night as a pilgrim. Great questions, Gilda. 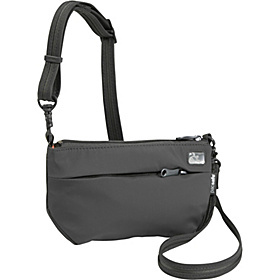 We’ve talked about another walking trip, but we would not do another long one. Maybe 1 week somewhere special, somewhere flat! 😉 I don’t know that I feel a lot more fit, but I know I’m much stronger now than on day 1 when we came across the mountain. I can walk up to 15 miles in 1 day and feel okay at the end of the day – tired, but okay. I couldn’t do that in the beginning – well, and my feet were SO much better when we left Leon it made a big difference, mentally and physically. Thanks so much for following our journey and posting comments, stay with us, there’s more to come! 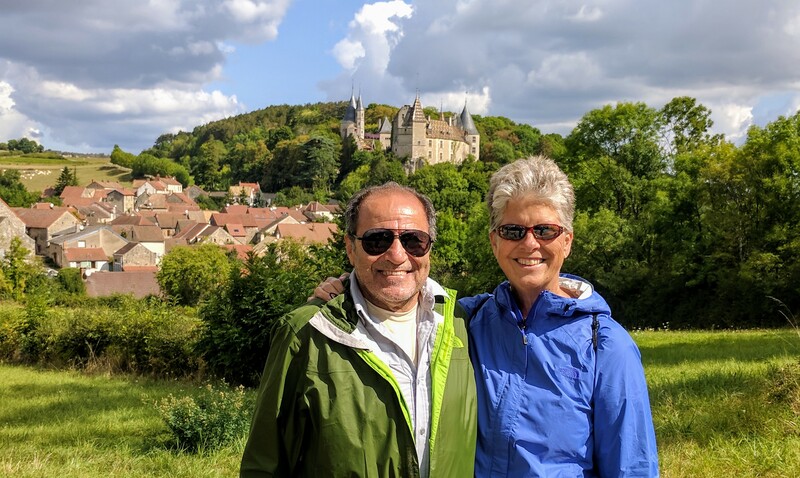 Celebrated my 69th birthday on the Camino. Fabulous, Primitvo was difficult and worth every step. Few pilgrims, just me and 2 of my adult sons. We would walk together.alone,2 of us. No plan . I,m happy I did it. Wow! Norma, what an amazing birthday gift you gave yourself. Walking the Camino was one of the most challenging things I’ve ever done but by far one of our most treasured memories, fantastic experience! Buen Camino! 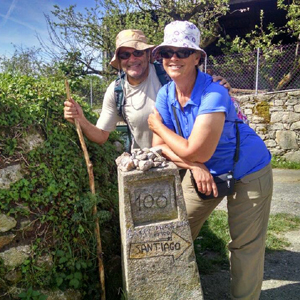 While walking the Camino we actually met a lot of Aussies, Estelle. We spent a couple of days walking with a couple from Australia before we got separated. Apparently, the Camino is very popular for a walk-about destination.